It can happen to any one at any time. It’s always a danger – and you’re almost never prepared for it. That’s right –running out of ink. Luckily Inkman is always there to help – 24 hours a day, seven days a week – Inkman is on line, to serve you. 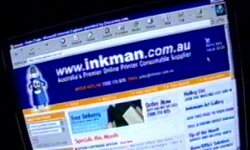 Not only will you find a massive variety of products on line, but Inkman will also save you time, not only buy ordering on line, but also with next day delivery, and money. And watchout for great specials – like mentioning Bright Ideas on orders over $70 and getting an inkjet paper pack worth $10 for free! Talk about a super hero! Inkman is the easiest, most reliable and most convenient way to buy all your printer supplies – ink cartridges, refill kits, laser toner, specialty print media and more. Inkman also stocks the most popular brands including consumables for Hewlett Packard, Canon, EPSON, Lexmark and many more.